A funny thing happened last week, as I was on my way to the Today Show, a clan of men in suits greeted me. One handed me a folded up newspaper that I accepted and I went on about my business. Later that day, I saw them riding around in another pack, but this time they were driving pedicabs. All of this creativity was for the promotion of USA Networks show, Suits. When I finally got around to thumbing through the newspaper, I was quite happy I didn’t toss it. To my surprise, the paper was by the online retailer Mr. Porter. 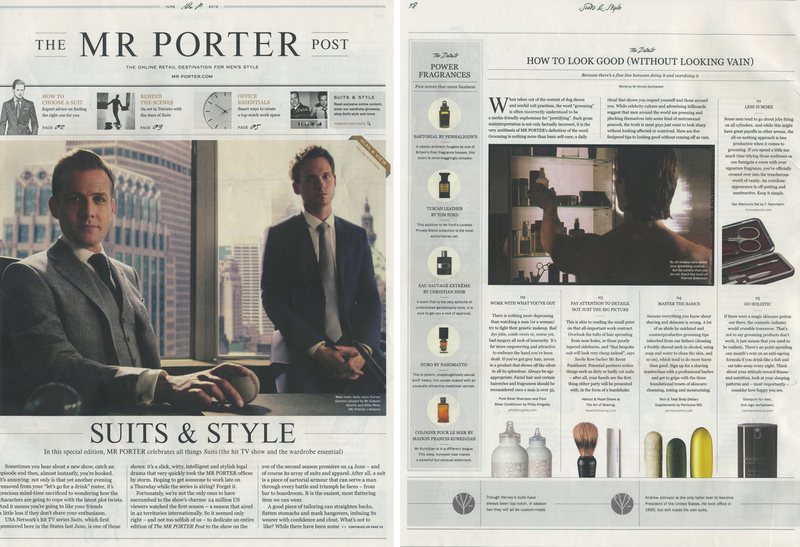 The Mr. Porter Post was chocked full of style tips, How To Choose A Suit, How To Look Good Without Looking Vain, and How To Get The Perfect Polish to name a few. All of the stories were quick reads but touched on the details of style. What a brilliant idea. They even had story in there about the show…hence the “suits” handing it out. What put it over the top for me was the fragrance discussion, Power Scents. If you’re going to make an effort to look good, why not smell just as good? Mr. Porter lays out five scents they believe connotes power and they include, Sartorial by Penhaligons, Tuscan Leather by Tom Ford, Eau Savage Extreme by Christian Dior, Duro by Nasomatto and Cologne Pour Le Soir by Maison Francis Kurkdjian. With no words, they leave up to you to seek them out and understand why they’ve made their list. This entry was posted in Good Read and tagged Christian Dior, Maison Francis Kurdjkian, Men's Colgone, Men's Fragrances, Men's Scents, Mr. Porter, Nassomato, Penhaligon's, Power Scents, Suits, Tom Ford, USA Network. Bookmark the permalink. That is so freakin’ cool! I have never watched the show, but I feel like somebody in the ad agency ought to be getting a really big Christmas bonus this year. It was truly an “only in NYC” moment. By the way- do you happen to know if there’s a clip of you on the Today Show? I am definately going to check out those fragrances for Alex. Another great article Barney! It’s great that perfumes (not celebuscents!) are getting spotlight in creative campaigns. Recently I read about another show using perfumes in the ad campaign. Non-existent perfume but nevertheless.